Are you worried that with Facebook’s constant changes to their news feed algorithm, that you are fighting a losing battle and your Fan Page posts will hardly be seen? Many people are but you don’t have to because you now have an unfair advantage with these 7 tips that will help you reach more of your Fans. In case you are wondering what the fuss is all about… not too long ago, Facebook announced that organic reach was going to drop because of competition in the news feed. In the last year, the number of Pages “Liked” by the average Facebook user has increased by 50%. With that much action in a typical users news feed, what chance is there for your content to reach your Fans? Well for most people… not much of a chance and they should worry. But for you… you don’t have to stress because I have put together 7 awesome tips for you that will keep your posts in the faces of your Facebook Fans. This is a great way to build a positive relationship with your Fan Page community. People make comments because they want answers – so give them exactly that! Reply to all comments and let them know you care and you want to help them. Plus when you reply to their question, that Fan will receive a notification from Facebook which will encourage them to come back to your page to read your comment. You can also run a survey. 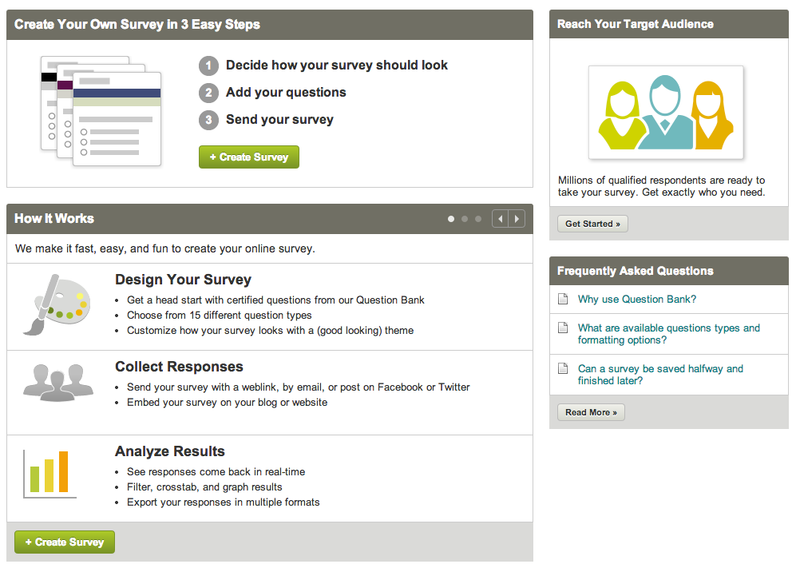 SurveyMonkey is a web based survey development site that makes creating surveys easy. 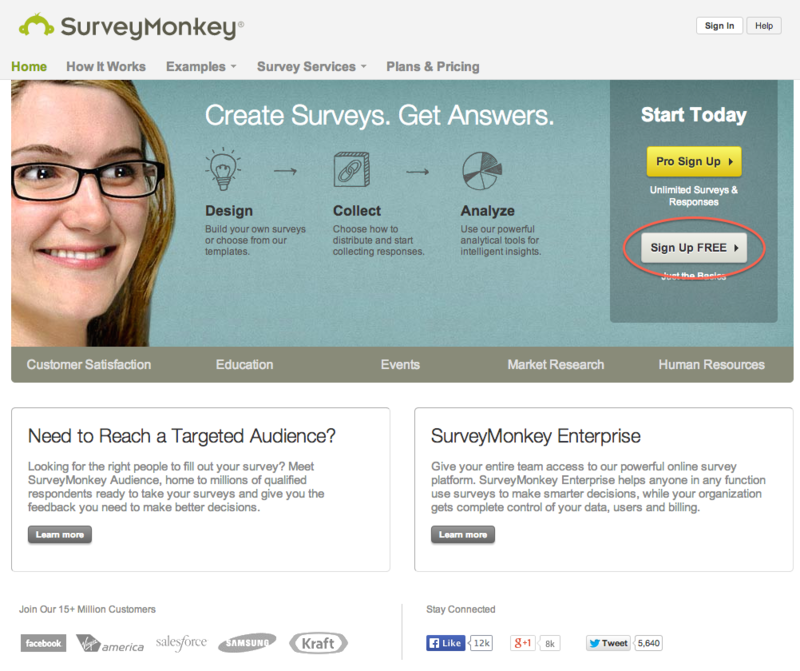 And SurveyMonkey has a free option that you can try out and upgrade to a paid package if needed. All you need to do is decide how you want your survey to look, add your questions and then send people to your survey. Simple! Give your Fans a look into your personal life. Photos of things you do with your family, trips you have taken on vacation, family pets… anything that shows a little bit of the real you. Tell them about the latest things that have happened to you. 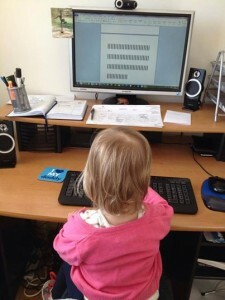 For example you can tell them all about the beautiful home office you just built and show them some pictures. Get them involved! You can ask them if they have any suggestions on what desk you should buy for your office. Maybe you have narrowed it down to 2 desks… ask them to help you pick the best one. Being personal and getting your readers involved will show people what your home life is like and that you really are a lot like them. People LOVE to interact with these kind of posts and this helps to build relationships. Have a “Fan appreciation day” or “Special Offers” for an entire week where you can provide Fan-only offers and contests. This will encourage Fans to participate and come back to your Page on a regular basis. You can have a contest where anyone that shares your content the most wins a prize. Another very popular contest is a “Caption Contest”. This is where you post a picture of something funny and ask people to create a title for it. If you have a business that sells a range of products – you can have a contest where your fans get to pick which product goes on sale. You can list 2 – 8 products and ask your fans to vote which one they want to go on sale. And whatever product gets the most votes – that one will be discounted. At the end of the contest, post the results on your Facebook page and email each person that took part in the contest and tell them which product won and how they can get the special discounted price. It only makes sense that if you want the best chance of your Fans seeing your most important content, it’s best to release it when most of your Fans are actually online using Facebook. No sense releasing your content when they are offline because it will only get buried in their news feed. Facebook provides stats that will tell you exactly when your Fans are online. To view those stats – goto “Facebook Insights”. You can find that by going to your Fan Page and clicking on the gear icon below your Page’s cover photo. In the drop down menu you will see “View Insights” – click on that. On the next page you will see a navigation bar that shows Overview, Likes, Reach, Visits, Posts and People. That’s all there is to it. Now you know exactly when most of your Fans are using Facebook! 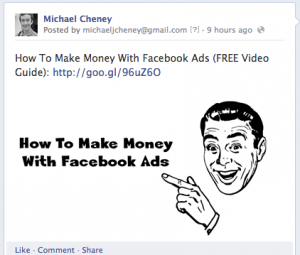 Buy Facebook Ads to promote your Page and attract NEW fans. 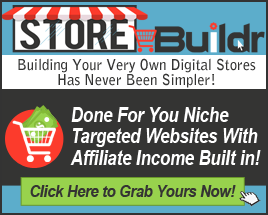 Advertise promotions and even newsletter signups. 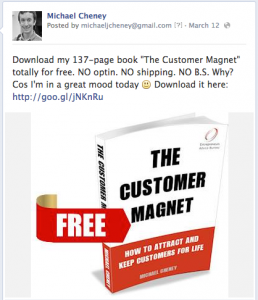 Use Facebook Ads to send people to either a post on your page or even BETTER… to a custom tab on your Fan Page like this. You can set up a custom tab on your Fan Page that you can have an optin form on and give away a freebie. A custom tab like this one is powerful because it has a Like button at the top right of the page and also in the middle of the page – that people can click on to become a Fan. It also has social proof where it lists the number of people who have already liked your page. DON’T pay to get “artificial” Likes – they are not worth the cost. Paying for Likes is dodgy and you are NOT getting REAL Fans. You are only getting bots or low paid workers that are hired to click Likes. You will also never be able to re-target these people, you will never get them to join your mailing list and they will never buy your stuff. Yes they will increase the number of Likes on your Fan Page… but at what cost? You could lose your Facebook account for one but also you will be wasting your informative posts on bots and paid workers who will never look at your page again. You see, every time you put a post out on your Fan Page, there is a chance that your content will be shared by your Fans and the post can go viral allowing more people to see your post. These new readers can also click on your Like button, become Fans and you will be able to send content to these people in the future as well. Your post going viral can bring in many new Fans really fast. On the other hand, if 50% of your Fan Page is made up of bots and paid workers, when you post an update there will be low interaction and Facebook will therefore think your post is rubbish and wont show your post to as many people. Share helpful content with your Fans and try to stand out from the crowd with top notch information. Your Fans will love you for it and will keep coming back on a regular basis to check out more. You can put together a pdf report and give that away to your Fans. A pdf packed with helpful information along with screenshots and images to really add value. If your report explains how to do something, add photos and/or screenshots that show exactly the steps that need to be taken. 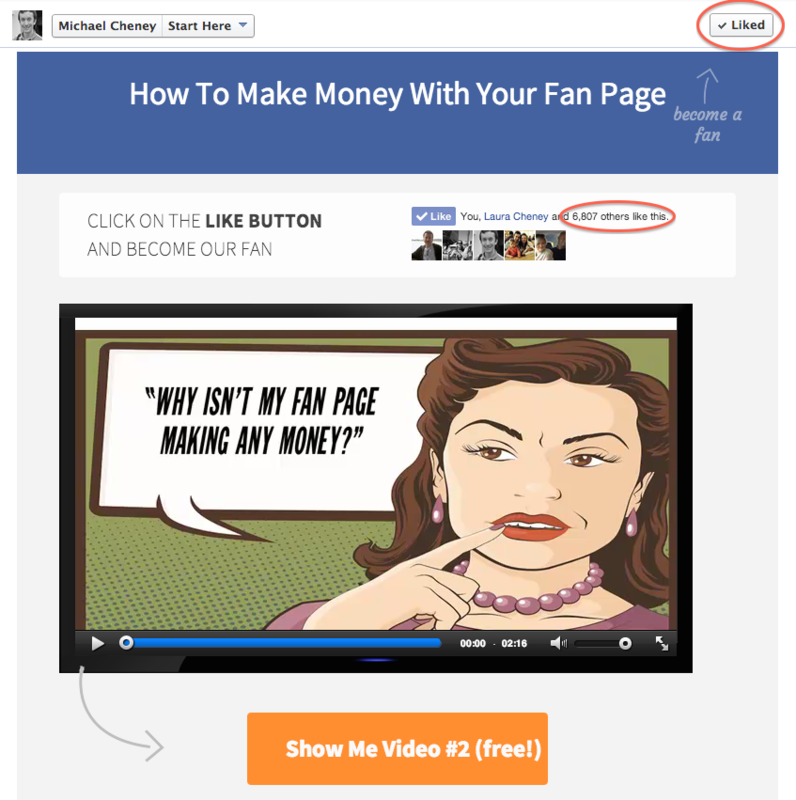 Posting informative videos and audios are other great ways to deliver content to your Fan Page. You can also mix and match by creating a post that contains 2 or more of the following… audio, video, pdf, images, infographics etc. It doesn’t matter exactly what you mix and match – the main idea is to add value. Also ask questions to get your Fans engaged with your posts. Once you get a discussion going, it can lead to others chiming in and the information discussed can be extremely valuable for your Fans. 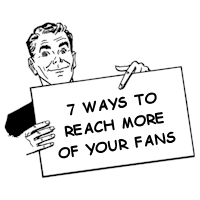 So there you have it, those are 7 tips that will not only help you reach more of your Fans but will also help you build your Fans the RIGHT way.